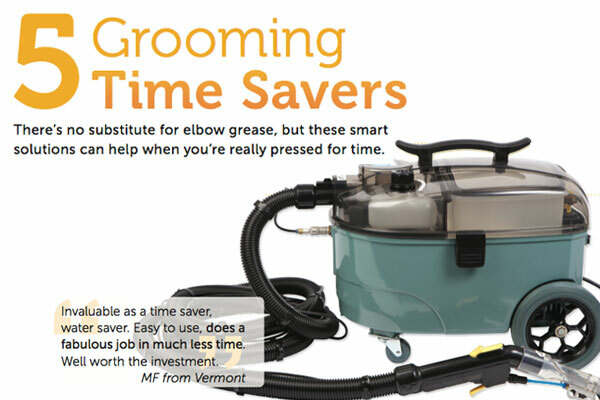 There’s no substitute for elbow grease, but these smart solutions can help when you’re really pressed for time. A deep clean is just minutes away with the Anivac. The patented system virtually eliminates drying time, and you’ll never have to wait for a wash stall again! Invaluable as a time saver, water saver. Easy to use, does a fabulous job in much less time. Well worth the investment. to bother searching for an outlet or untangling the extension cord. Everything you love about ShowSheen, now in an ultra-light finishing spray. ShowSheen Hair Polish eliminates sopping wet tails and drip marks on the coat. The Ultimate Hose Nozzle saves you from constantly turning the water on and off. Plus, if you accidently drop it, it won’t spray your horse in the face and send him rocketing off the crossties. A quick and easy way to remove all those unwanted whiskers. Horse Shave.